On Wednesday’s our salad wears pink. This pretty in pink salad combines the pepperiness of wild arugula with the spiciness for a sriracha yogurt dressing and the pop of color from pomegranates. Add some cooling cucumber and a little fresh mint for a salad that’s a striking as it is delicious and nutritious. When in Malibu I to use a large oval Marina platter that I found at the Malibu Beach House shop at Trancas Market – full of treasures that make it a dangerous to shop there too often. 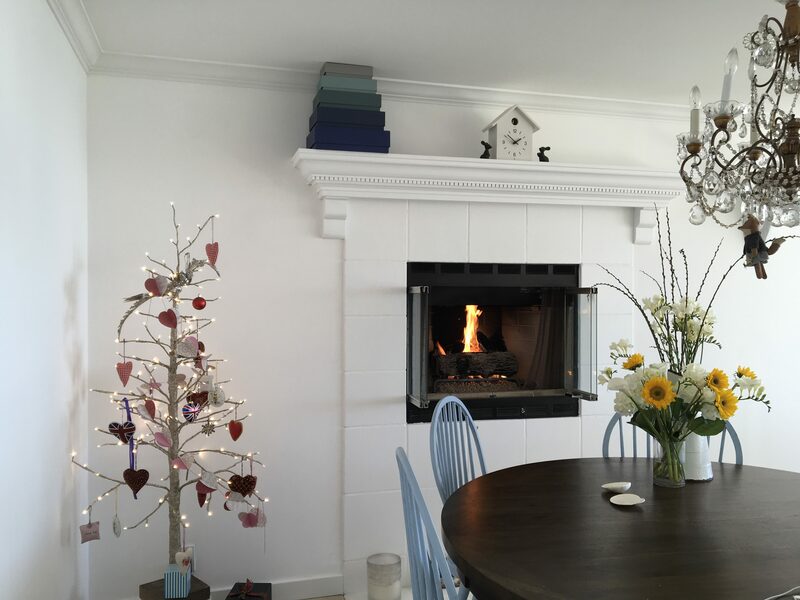 It’s where I found my little tree that is so gorgeous I’m keeping it up all round – at the moment it’s still adorned with hearts from Valentine’s Day – only LOVE – but I will soon swop them out for spring flowers and birds. Arrange the wild arugula on a large platter. 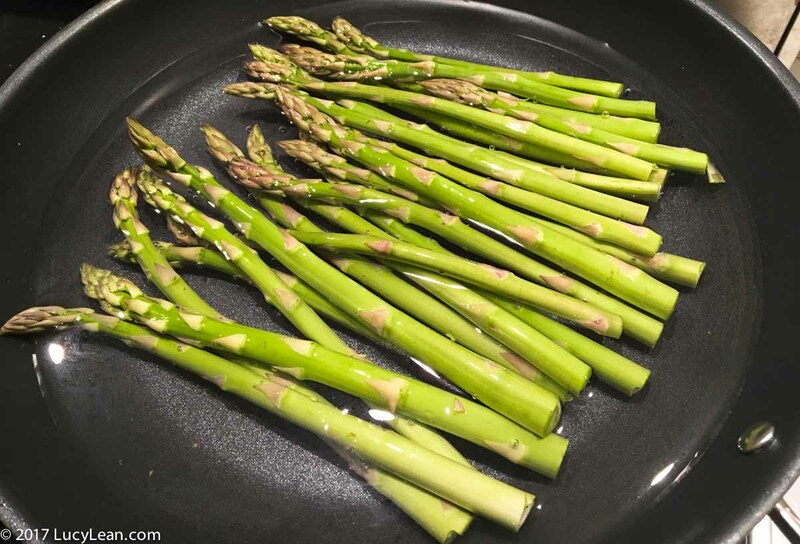 Place the asparagus in a large pan,I’m loving my new oversized pan from Kitchenaid, cover asparagus with water and bring to the boil. Cook for 5 minutes. Remove from heat and blanche the asparagus in iced water. Dry and arrange on top of the arugula. 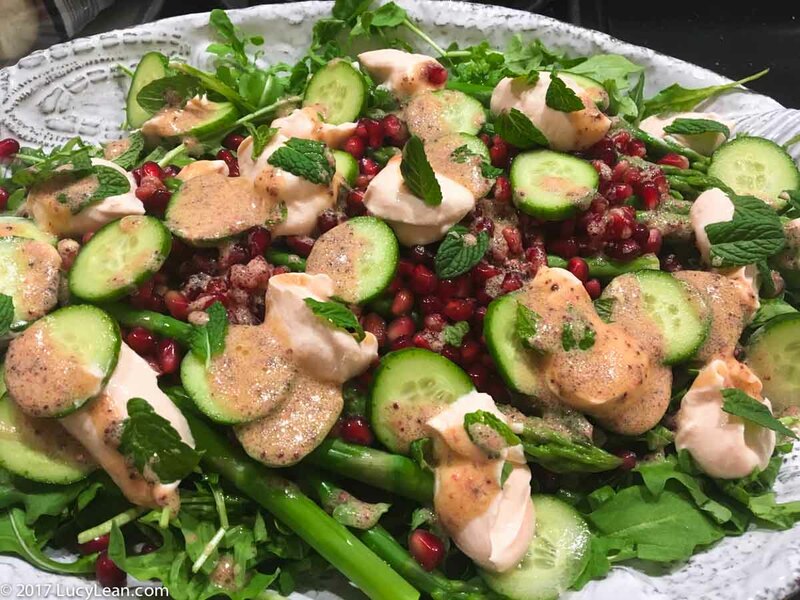 Arrange pomegranate seeds and cucumber slices on top. In a small bowl mix together plain yogurt with the juice of half a lemon and a generous squirt of siriacha. Using a teaspoon place over the top of the salad. For the salad dressing mix 2 tablespoons olive oil with 1 tablespoon champagne vinegar and 2 teaspoons of pink blackcurrant dijon mustard. Drizzle over the salad. Top with mint leaves and serve immediately.